Description : Want to hold cosmetic accessories, makeup tools as more as possible? and easily locate them as quick as possilbe when you need to use them? 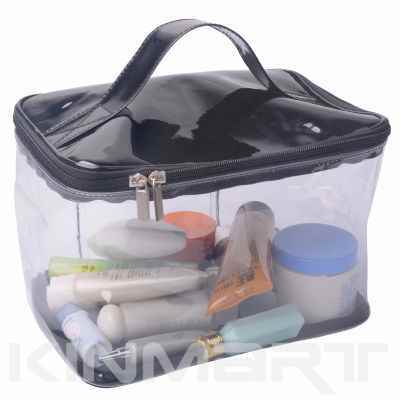 then try our this Large Vanity Bag, made of clear vinyl with spacious compartment. Different Colors are available, basing on personal fond of colors, by changing the matching fabrics to others or other colors. Such Clear Vinly Vanity Bag is personalizable by by imprint only, at the center; or a little lower at the bottom. Further Customization can be achieved by changing the vinyl fabric, as well as zipper pull, and Colors. Try to use <Personalize A Logo> or <Custom Bag More> to quick realize your design. I would like to get this cosmetic bag made in 3 different sizes. Could you please make a sample of these asap and quote us what our cost would be. We will be looking to place large quantity orders after review of samples. Thank you for your inquiry for our products, and as we professional bag manufacture, we can custom clear cosmetic vanity bag in different specification. Please let us know your potential required quantity, and which 3 differences sizes you need, then if it’s based on the same material as that of our bag Km-A2009.050, then we can quote you the prices first. After your approval, then we can move on the make the samples for your further approval, and we charge US$*. ** per pieces, and courier fee of US$** . ** to courier to USA. Hi Pls let me know when can the order reach me & how much for a order of 50pc. Thank you. Joyce *I need it by 17th July 2013. Thank you for your inquiry and your message left.